ECTP at Anthony Lakes July 22nd from Santiago Rodriguez on Vimeo. Pedro demonstrating ECTP at Anthony Lakes. Anthony Lakes has always been an option for Boise skiers. Not a bad drive, and just 20 minutes longer than driving to Banner Summit from Boise. The ski touring at Anthony Lakes possibilities are many. Please refer to the next link for a really nice resource. Caltopo is an incredibly helpful planning tool with its signature feature where slope angles are colored in the topo map. 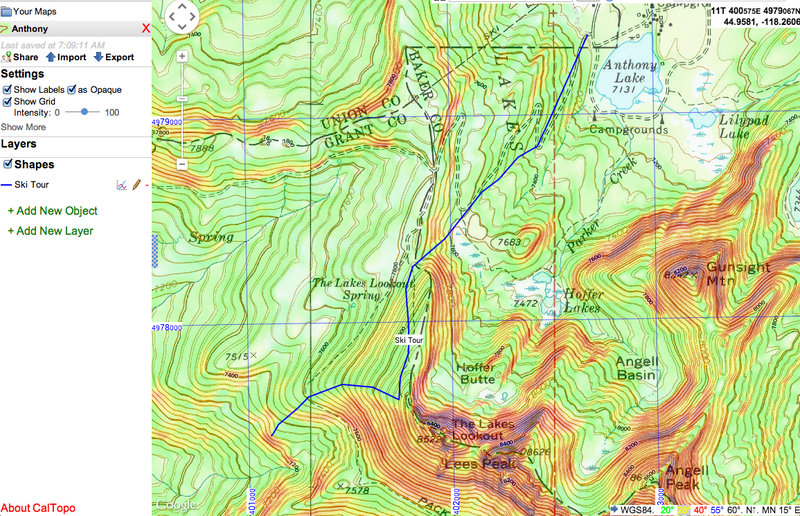 CalTopo very user friendly interface makes easy to add UTM lines, 40' contour lines to the topo map, among other cool features, as well as to print or save maps. The next image captures the ski tour we did today in a blue trace, but also shows the interface of CalTopo. Please if you use this tool in a regular based send a 'Thank You' note to the Matt Jacobs, owner of the site or better ... make a tax-deductible donation to Bay Area Mountain Rescue via info@caltopo.com. Skiing last Saturday at Mores Creek Summit was fun, but Pedro and I wanted ... more snow, and Anthony hardly ever fails to provide the goods. Sunday was not the exception. Pedro and Jesse preparing for the first run. The backcountry was covered by a recent coating of 30 cm of creamy and somewhat heavy snow that felt like 12% dense. A combination of factors confabulated to densify the snow throughout the day; moderate winds from the west, heavy moist fog, and temps hovering near the zero degrees celsius for most of the day. But we rejoiced in not having to worry too much about what lies below the snow. The snowpack depth was around 1.2 meters. Although, we should never forget that we are in the mountains and Anthony is a granite garden, thus we still had occasional contacts with buried boulders. Today we had a guest with us, Jesse, on his second outing to the backcountry, but first time on a winter ski tour. We always enjoy introducing the winter wonderland to those willing to explore. As noted earlier by the video, conditions were unstable. Stability test early in the day produced two CTE-Q1(SP), a CTM-Q1(SC), and ECTP11-Q1(SC). All failures were observed at 45 cms below the snow surface, where a 2 cm layer of facets undermined a fragile decomposing crust interface . The test slope had a SW aspect at 28 degrees test slope at 8100 feet. Below the 45 there was another fragile crust layer also undermined by another even thinner facet layer. The rest of the snowpack was facetty with various crust layer in between. While skinning up we had numerous whumpfs, where we also remotely triggered a very small avalanche in a steep roll-over. But based on earlier stability results we were only skiing gentle slopes with slope angles under 30 degrees. Notice the fractures (cracks) and small avi. Instability was also present at north aspects. On our way back to the car we approached a ridge with North aspect slopes. At Poster Ridge we remotely triggered a collapse with cracks spider webbing across the slope but the slope did not slide. Mores Creek Summit has a similar structure of fragile crust layers undermined by well developed facets, but it lacks the 45 cm of snow loading present at Anthony Lakes. And as Pedro stated earlier in Sunday during our drive to Anthony Lakes after observing road cuts with avalanche fractures, the faceting of old snow after weeks of zero precipitation was a regional issue. We should not be surprised to observe similar problems across central Idaho.